Sheesh. Half way into January already. Somewhere amidst Christmas, New Year’s Eve, the Sugar Bowl, returning to a “normal” schedule, three snow days, and life in general…I neglected a post I do every year. My friend Karen C.L. Anderson – writer, blogger, coach, self-acceptance and healing guru – introduced me to this concept several years ago. She discovered it through Christine Kane, an expert in helping women focus their professional lives. Instead of setting a resolution for the new year, a Word of the Year is broader. It gives your year focus, but allows for many ways to make it happen (one destination, many paths). I find when I don’t choose a Word of the Year, I feel more scattered and at loose ends. And frankly, I’m tired of saying “I’m going to lose 20 pounds” or “I’m going to get organized”, only to get to April and laaauuugh. There are ways to arrive at your Word. If you go to Ms. Kane’s website, there’s a guide to help you with the process. For me, the biggest help (and biggest challenge) is stillness. Allowing myself time to just be, with no TV, no music, no tech…just comfortable clothes, maybe hot tea, and time to reflect. Not analyze. Reflect. Stroll through the archive of my life and look at things as an impartial but curious observer. The answer doesn’t always come right away. It can take several days and several tries, but a Word comes. And if I keep circling back to it, that’s a good sign. One of the first times I focused on a Word of the Year, I came up with Fearless. Maybe it should have been “Fear Less”. I’ve always wanted to be “right”, to be the smartest kid in class, to not be wrong or make a mistake. But those desires hogtied me. They kept me from making any decisions. I’d rather sit on the fence than be wrong. So I decided that year to be Fearless. It was a word I could hang my hat on. When faced with a tough decision, I could pull up one word. Fearless. Don’t be afraid to be wrong. Don’t be afraid to be right. Don’t be afraid. While it never made things easy, it did help. Instead of a laundry list of failed resolutions and things I wasn’t accomplishing, I could remind myself of one goal. Fearless. In 2014, my Word was Authentic. I spent a lot of time playing small, keeping my feelings to myself so I didn’t rock the boat, and living other people’s visions of my life. As is written in Ecclesiastes, “there’s a time for silence, and a time to speak.” I spent a lot of time in silence. Sure, I functioned, but mostly I was silent. So last year, I decided to be Authentic. I knew that meant I potentially would shock and irritate people…but is that my problem, or theirs? People who are used to me not standing up for myself or a principle were surprised…and sometimes I surprised myself, especially when that act of courage went well. But I grew. And I’m still growing. Just because the calendar has flipped to 2015 doesn’t mean I’m done with being Authentic. It takes practice. So does Fearlessness, for that matter. 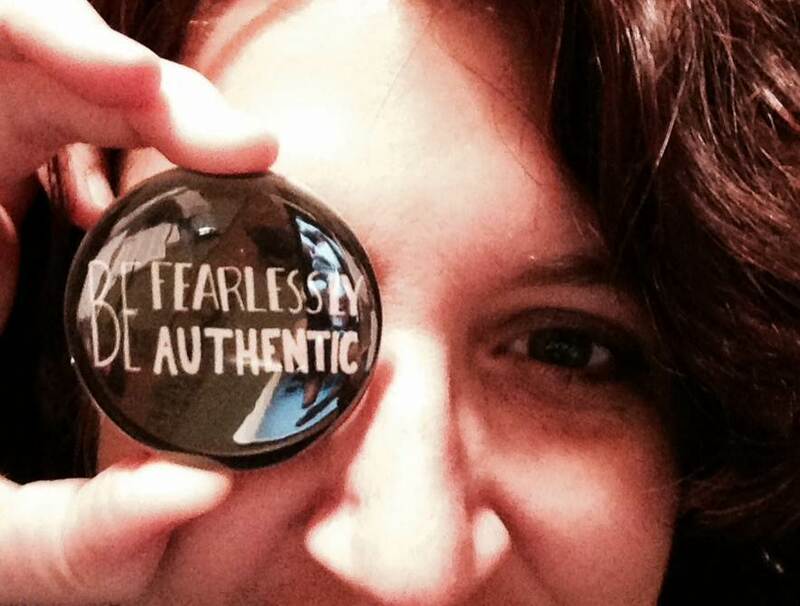 On my refrigerator is a magnet and in my purse a small mirror with the legend “Be Fearlessly Authentic”, courtesy of There’s a Badge for That. Ms. Claire, the owner of TABFT, posted the image on the company’s Facebook page one day. She didn’t know it, but she reminded me of who to be. A few friends were on the receiving end of my quest for Authenticity. I don’t think they’re still honked at me. One actually appreciated the honesty. The expression was necessary, but the execution could have been better. So where does that leave 2015? Like Fearlessness, Authenticity needs practice. It might take years, but that’s okay. I’ve decided on a new Word of the Year. For me, this isn’t about living at the gym and denying myself things I enjoy. It’s about living in balance. Not just talking about, but implementing self-care. It means sleeping when I need to sleep. Seeking out good people when I’m lonely. Allowing myself to spend time doing nothing if that’s what fits. Saying no. Saying yes to things that are fun simply for the sake of fun. Eliminating foods that make me feel sloth-like. Trying new things like dance, yoga, and even painting. Making time to do a Bible study, even if I can’t make the class. Expressing feelings, even the “ugly” ones, is a part of Wellness. Listening to music. Reclaiming things I once enjoyed, and finding new things to add to the list. In my line of work, I see people ailing in body, mind, and spirit. I realize what a short ride it is from well to unwell. In order to be the best that I can be for others – my children, my family, my friends, the people who rely on me – I have to be Well and take care of myself whenever possible. So what’s your favorite way to practice self-care and wellness? Are you a resolution person, or a Word of the Year person? Do you have a Word of the Year? Please chime in!